Are you free this Sunday?? Do you love beauty products and enjoy meeting brands - and like free tickets, then Professional Beauty is for you! I have been for the past few years, as a blogger and also a normal visitor. There are quite a few bargains to be had - and I always come away with some goodies that are much cheaper than the RRP. Housed at the ExCeL London from Sunday 25th February to Monday 26th February Professional Beauty is fantastic for those who own professional salons nationwide, and people like me that like a bargain, and enjoy interacting with like minded people. So, who are Professional Beauty? 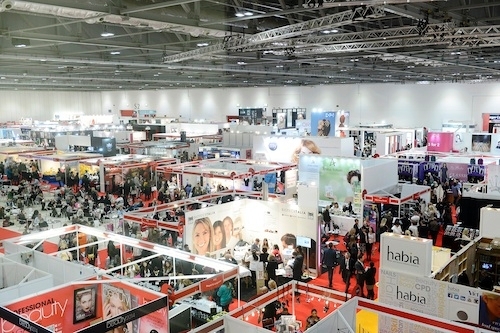 Professional Beauty produces the market-leading exhibitions, magazines, awards and conferences for the salon and spa market. Their aim is to expand the market for professional treatments. They do this by helping people working in the profession to become better business people and they are active at encouraging new people and business into the profession. Successful for more than 30 years. The market-leading Professional Beauty exhibitions take place in the UK and Ireland as well as South Africa, India and Dubai, bringing together the key brands at an industry gathering of beauty, spa and wellness professionals. If you’re looking to expand, sharpen your client offering or if you just want to save money, then this is your show. tanning, Professional Beauty has it all. I particularly head for OPI Professional Nail Care, Aromatherapy Associates, Dermalogica and Murad. The Brands a much cheaper than usual - they offer "at show bargains", and I generally stock up on as much as I can for gifts for friends and of course for myself!